Microsoft co-founder Paul Allen has said he will commit the majority of his estimated $13.5bn (£8.8bn) fortune to philanthropy after his death. Mr Allen follows fellow co-founder Bill Gates in pledging billions of dollars to projects designed to help others. He set up a charitable foundation 20 years ago that has given $400m. He has personally donated a further $600m. Mr Allen founded technology giant Microsoft with Mr Gates in 1975 but left the company in 1983. "I want to announce that my philanthropic efforts will continue after my lifetime," said Mr Allen, the 37th richest man in the world according to Forbes magazine. "I've planned for many years now that the majority of my estate will be left to philanthropy to continue the work of the foundation and fund non-profit scientific research." The announcement comes a month after Mr Gates and fellow billionaire Warren Buffett launched a campaign to urge the richest individuals in the US to pledge half of their fortunes to charity. 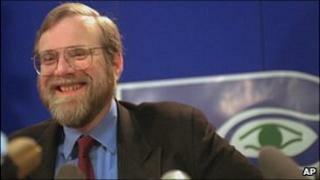 Mr Allen left Microsoft in 1983 after being diagnosed with the blood cancer, Hodgkin's disease. He successfully beat the illness and went on to become a successful venture capitalist with his media and communications investment firm, Vulcan, from 1986. In a bitter irony, Mr Allen's sister revealed in 2009 that the entrepreneur had recently developed another form of blood cancer, non-Hodgkin's lymphoma.